Many of you will have been following my quest to create perfect scrambled eggs. I was reading Where shall we go for dinner? 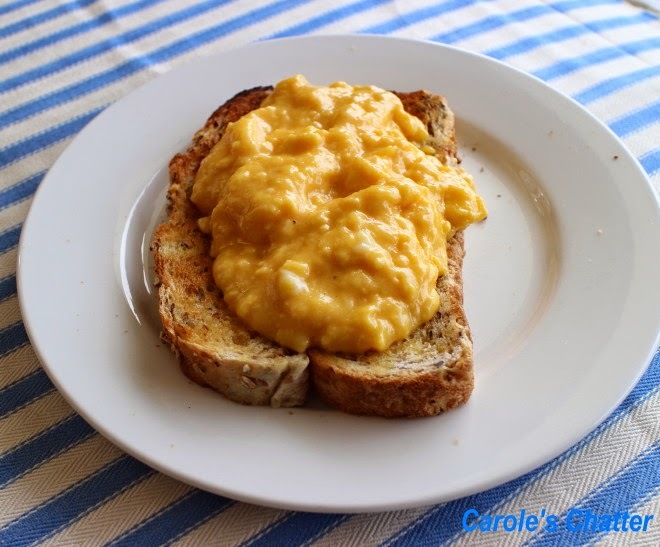 By Tamasin Day-Lewis and came across her recipe for scrambled eggs – I tried it and they are the best I have achieved so far – even though I didn't add milk or cream. She says to whisk up your eggs with a slug of full milk or cream and to only add pepper at this stage and not salt. Melt a generous amount of butter in a pan over as low a heat as you can manage. Add the egg mixture and take it off the heat straight away and start stirring. Just alternate putting them on the heat briefly and then off and stir – the more slowly the eggs cook the better they will be. This was a real test of patience for me. Once the eggs have begun to set loosely take theem off the heat and stir in some more butter cut up into little bits. Return to the heat briefly but take the eggs off while they are still really sloppy. The eggs will continue to cook when you have spooned them onto a plate. Season with salt to your taste just before serving. my best advice for scrambled eggs is similar. fresh eggs whisked and poured into a nonstick pan with butter...really good butter. low and slow! they should never look like scrambled eggs in photos. they should look like day-lewis's. Sounds delicious and worth it, I just don't know if I have that much patience!